The background to the Pastoral epistles is a matter of some speculation. The letters to Timothy and Titus are collectively called the “pastoral epistles” and are usually described as “letters to young pastors” on topics of church organization. This common way of describing these letters misses the obvious fact that by this point neither Timothy nor Titus could be called “young,” nor are they ever really described as pastors in the letters. Both men are described as personal representatives of Paul and both men are given the task of dealing with some sort of theological deviation from Paul’s gospel which likely includes some practical, moral failure on the part of elders and deacons in Ephesus (and potentially Crete). First Timothy is less of a manual that could be subtitled “how to be a pastor” than directions to Timothy on how to deal with a serious problem plaguing Paul’s churches in Ephesus. This is how I would reconstruct the situation behind First Timothy. I am more interested in placing these letters into Paul’s career at this point that describing the “opponents” who are implied by the letter. After teaching through the material over a few months, I will return to the difficult problem of the opponents. Paul spent about three years in Ephesus (Acts 19). During this time he would have established churches in the city and trained others who planted still more churches. Colossians is evidence that at least one other city near Ephesus was evangelized by a Pauline disciple. Revelation 2-3 mentions 6 churches in addition to Ephesus which may have been established as a result of Paul’s three years of ministry in Ephesus. While it is impossible to know how large the church was in Ephesus when Paul left, we do know from Acts that enough people had joined the Christians that they were an economic threat to the silversmiths who made small models of Artemis (Acts 19). In Acts 20, Paul’s final words to the Ephesian elders predicts that there will be some among the Christians who fall away from sound doctrine and practice. The connection between Acts 20 and the pastorals has led scholars such as C. F. D. Moule to suggest that Luke himself is the author of the letters. Luke intended them as an epistolary conclusion to his Luke/Acts. For a review of this argument, see Hagner, The New Testament (Grand Rapids, Mich.: Baker, 2012), 623. Paul traveled to Jerusalem where he is arrested at held under house arrest in Caesarea for two years. He is then transferred to Rome after appealing to Caesar. He is in Rome under house arrest for two years. This is where the book of Acts ends. In all, Paul is away from Ephesus for at least five years before he wrote First Timothy, perhaps two or three years more than that. Paul is released from prison after Acts 28 and continues his ministry, likely into Spain but perhaps visiting churches he established in the earlier parts of his ministry. Somehow he learns that his fears for the Ephesian churches have come true and some elders / leaders have moved away from Paul’s teaching and practice. The nature of the problems in the Ephesian churches may be a division between “Pauline congregations” and Jewish-Christian congregations. Timothy was sent to Ephesus to encourage the congregations to “guard the deposit” which had been given to the churches. As Bill Mounce points out, Timothy was not a pastor, or elder, or bishop in these Ephesian churches. He was “an itinerant apostolic ‘delegate.’” (The Pastoral Epistles, lviii; citing Jeremias). Timothy has already been sent to difficult situations as Paul’s personal representative, he was sent to both Thessalonica (Acts 17) and Corinth to continue Paul’s work. 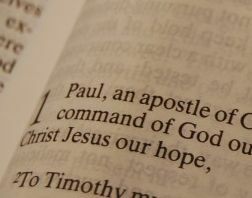 ← What are the Pastoral Epistles?